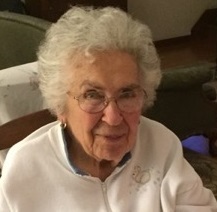 Alice M. Baum, 94, of Allentown, passed away peacefully on Thursday, February 7, 2019 in the home of her daughter. She was the wife of the late Irvin M. Baum. Born in Kempton, Alice was a daughter of the late Paul and Elizabeth (Dietrich) Fenstermaker. She was a graduate of Slatington High School. Alice worked for Mack Trucks in Allentown for 18 years before retiring in 1985. Mrs. Baum was a member of St. Timothy Evangelical Lutheran Church, Allentown, where she was a member of the Quilting Group. She was also a volunteer for Lehigh Valley Hospital for 25 years. Survivors: Sons: Donald I. and his wife Carol of Allentown, James A. and his wife Tina of Schnecksville, Glenn D. and his partner Ted Hickman of Oakland Park, FL; Daughter: Carol L. Jones and her husband Rick of Allentown; Grandchildren: Scott, Jodie, Brian, Teri, Kim, Justin; Great grandchildren: Gabi, Sydney, Owen, Ellie, Aaron, Brayden, Evan, Samantha, Daniel, Adam; Brothers: Harold Fenstermaker of Kempton, Forrest Fenstermaker of Williamsburg, VA; Sisters: Ruth Klinger of Middletown, Marie Knauss of Kent, OH, Marion Fenstermaker of Kempton. Services: 10:30 am Monday, St. Timothy Lutheran Church, 140 S. Ott St., Allentown 18104. Call 9:30 – 10:30 am Monday in the church. Arrangements by Stephens Funeral Home, Inc. www.stephensfuneral.com. Contributions: In lieu of flowers to the church.